In many organizations it is seen as less important than external communications and any measures to keep staff informed can be taken as an after-thought rather than a strategic, well-executed communications initiative. The basis for any improvements in internal communications should be a well-written, well-researched and easy-to-follow communication plan. This will determine what you will communicate to staff, when you will communicate it, who is responsible for carrying out the communication, how frequently you will communicate and what delivery channels will be used to share your message. Despite your best efforts to improve internal communication, you might still encounter staff telling you that they didn’t get the messages. Email – the most-used method of delivery for internal communications. Whether it’s sending in bulk to the entire organization, sending to individuals, or sending to groups. Most of your employees have an email address, especially if they use a computer all day. Intranet – your company-wide internal website where you can share important news, policies, procedures, contact details and so on. Enterprise social network – this is the use of social media websites within an organization to connect people to share information and ideas. Newsletters – either electronic or hard-copy, newsletters are distributed at set periods of time collating different news stories from within the organization to share with staff. Meetings – when employees come together face-to-face to share information and collaborate (can also be done via phone or video conferencing). Instant messaging – a useful tool for one-to-one or small group communicating that saves the need for a group email and the dreaded “reply all” feature. It’s a good tool to use for quick, short communication and getting instant feedback. Team spaces – there are various types of apps that do this job on the market. Essentially it is a place for teams to come together and share documents, ideas and keep discussions in one place where they can be organized, archived and searched. For many employees, keeping up with all of this communication can be exhausting and daunting. Actually giving too much choice can be detrimental to your internal communication efforts. 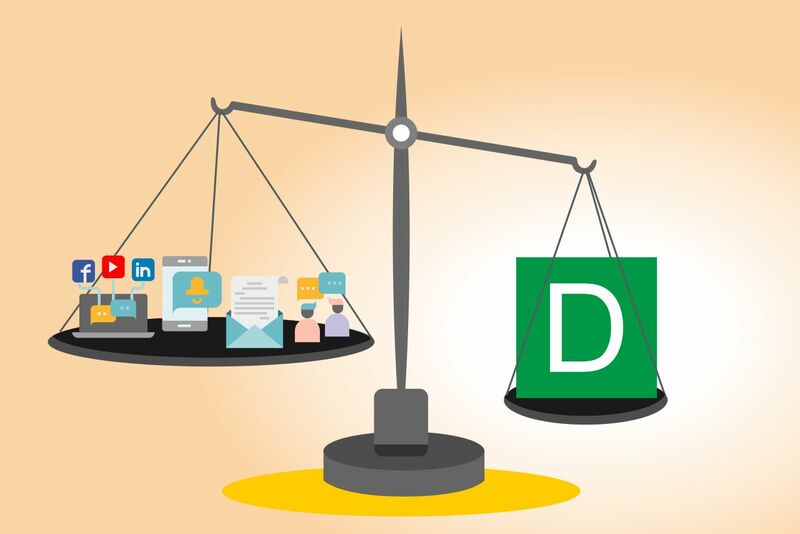 Email, that tool so many rely on, causes so much stress and anxiety for many employees who struggle to tame the size of their inboxes. They can’t open, read and deal with emails fast enough as more and more pour in through the day. This means that important news or information you have shared this way gets lost. Having to check the intranet, enterprise social network, team space and so on throughout the day for updates is also digital noise and a lot of people don’t have time for it or forget to do it. As a communicator you have probably heard people tell you over and over that they didn’t get the information that you know was sent out… and this is almost definitely why. The good news is there is a practical and easy to implement solution to cut through the digital noise and clutter in the internal communications space and ensure that your important information, news and updates reach your employees. DeskAlerts is an internal communications software system that you can deploy right out of the box to reach your employees in real time, no matter where they are. The system works by providing you with an interface that you can use to send pop-up notifications straight to your employees’ desktop screens. The messages will appear no matter what other software application the staff member is using at the time, and will even appear if their screens are on standby, locked or in screensaver mode. The messages can’t be skipped, ignored or minimized. The benefits of doing this are apparent: you’re not expecting them to open an email at their leisure or go searching for information in various other locations – you’re getting it right “in their faces”. You’re able to send DeskAlerts notifications to the entire workforce, to specific teams or groups or other custom audiences. You can even send to individual employees. Messages can be scheduled to send later, and templates can be customized and pre-populated with key information, saving you valuable time when you need it. For many reasons you may have employees who aren’t located in front of a computer screen when you need to communicate with the workforce. They might be traveling, at a client’s office, working in a role that doesn’t involve a computer, working remotely or just out of the office. The good news is you can still reach these employees no matter where they are using DeskAlerts. DeskAlerts has custom apps available from the Apple and Google stores that employees download and install on their smartphone or tablet devices. It then pushes notifications straight to their device screen, meaning no matter where they are they still know what’s going on. A range of other add-on features in DeskAlerts make it a diverse and multi-functional tool. You can send scrolling ticker-tape newsfeeds along the bottom of your employees’ computer screens, deploy custom corporate wallpaper or screensavers on their devices, or use it to send information to digital screens to create digital billboards. It can also be used to send surveys, polls and quizzes where you get results in real time, or to gather RSVPs to important corporate events. 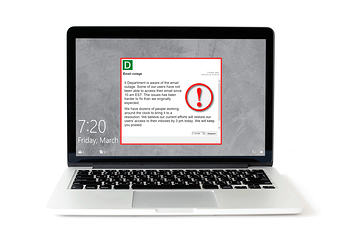 DeskAlerts messages can be sent in a range of multimedia formats, from text to video to Flash to pictures. You can include hyperlinks in your messages to direct employees to more detailed and comprehensive information that lives somewhere else such as on your company website or intranet. The statistics module in DeskAlerts will let you see which staff members have seen your messages and when – you can even track this right down to an individual device. This makes your job reporting and evaluating on your internal communications campaign easier.